Below is from a post we just put up on the Foundry blog. It’s critical in this election that the business community in Boulder takes a stand for progress and against closing the doors to the city. The two issues below are of great importance to the city of Boulder. So is electing a strong and reasoned City Council. I’m supportive of OpenBoulder’s approach to that and they have great information on the candidates they’re backing. In particular I’ve been helping my friend Bill Rigler with his campaign and would encourage you to be sure to include him as you vote. He’s a thoughtful, progressive leader who will bring great energy and mindfulness to our city. This year’s local election in Boulder is a critical one. The city that we love risks shutting its doors. While the business community in Boulder has contributed immeasurably to the vibrancy, charitable contribution base, economic development, and success of our community, there is a faction in Boulder that feels that our city should stop moving forward and instead should live in the past. This faction believes in a less inclusive Boulder and aims to achieve this goal by literally shutting the doors to our city. This is what is behind propositions 300 and 301 which are proposed amendments to the city’s charter. This faction is well organized and well funded and the slogans make it sound reasonable. But make no mistake: the goal is to immediately freeze all development of all types around the city by enveloping the city a bundle of political red tape. These initiatives must be voted down. While innocuous sounding, the names of these initiatives completely misrepresent their intent and the dire consequences that would result if they are enacted. The truth is that neighborhoods already do have a say in projects that affect them, and developers already do pay some of the highest fees and taxes in the country. 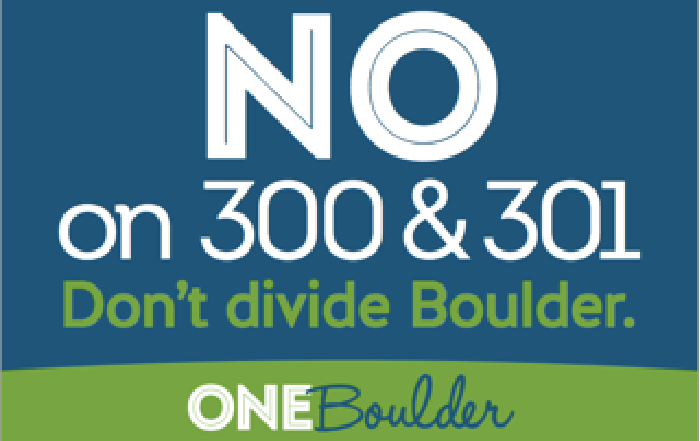 Effectively, these proposals will create 60+ neighborhoods in Boulder. Can you imagine what would happen if we had that many homeowner associations that had the power to hold special elections and veto land use changes approved by city council? The smallest of those neighborhoods would be comprised of just 19 houses. That’s not “local control” (which already exists), that’s a deliberate attempt to create gridlock. These initiatives will immediately freeze important infill development, including affordable housing, transit-oriented development, neighborhood serving retail, social service centers, and day care centers. The city manager has stated that the city will stop issuing permits of any kind for at least six months while they figure out what these initiatives mean and how to implement them. Once they do start reissuing permits, these initiatives will force the city to levy such high taxes and fees that development will effectively stop in Boulder. This will stop our city in its tracks and greatly exacerbate an already expensive housing market. It’s critically important that we defeat these measures. To do that we need to get the word out to those in our community who want Boulder to continue to be a vibrant city. The sad irony is that those promoting these measures have the time and organization to put towards pressing their backward and closed agenda while many who oppose it are busy helping keep Boulder prosperous by creating jobs and economic growth. This is a battle we can’t afford to lose. Please take a minute to help us get the word out. Send it to your friends via email and social media. Urge your neighbors to vote and make sure you vote yourself. With ballots mailed out this week many in our community will be voting in the next seven days (over 50% of ballots are returned within a week of their being sent out).